It’s another great double-header weekend, this time in Episode 333! First up is the return of Tyler Chin-Tanner from A Wave Blue World, who has a Kickstarter going on for the anthology book All We Ever Wanted: Stories of a Better World! We discuss this project, including his role in it and who else is making this positive book happen! The project concludes on Wednesday, July 4, at 12:04 p.m., so be sure to get your support in now! Then everything wraps up with Jay Gillespie, who does just about everything except print his Indie series Severed Souls: The Order of the Revenant. This book explores the supernatural and its possible impact on people and the world since ancient times. We discuss the upcoming release of the sixth issue and what else we might expect from him in the near future! You can buy and download his first five issues on Comixology at this link, order paper copies at this link, or join his Patreon here! It’s another double-header this week in Episode 326! First up is Stephanie Phillips, writer for Kicking Ice, a terrific story about two young girls and hockey, and Yawaan, a supernatural thriller dealing with possession. She discusses both books in depth, including how they came to be as well as who the characters are. For more about Stephanie and her comics, be sure to go to her website here. Then everything wraps up with my interview with Rafer Roberts, who talks about his upcoming Dark Horse miniseries Modern Fantasy, and his webcomic Nightmare the Rat. Rafer tells us about each story, where they came from and what we can expect from him and these stories in the future! For more about Rafer and his storytelling, check out his website here. Landmark Episode 325 goes where this podcast has never gone before – Two interviews about the same great upcoming comic, Flavor from Image Comics! First up is the return of Joe Keatinge, writer and co-creator, and culinary consultant Ali Bouzari. They discuss this fun comic, sharing behind-the-scenes info about the importance of cooking and food to talking about the various characters and their roles in this new ongoing series. Then we turn to the art team as I talk with artist and co-creator Wook Jin Clark and colorist Tamra Bonvillain. We delve into the look of the series, including choices of color and appearance of characters and backgrounds. You won’t want to miss this series as it adds “flavor” to your comics reading diet! Don’t miss it! It’s always great to talk with independent comics creators, particularly those who are adding fresh storytelling to the industry! This week, I talk with Justin Bartz, the writer and co-creator of an excellent book titled Project Shadow Breed. Both issue zero and number one are now available, and I enjoyed them both! Together with Josh Schneider and Matt Maldonado, Justin has successfully fused superheroes with the supernatural. He talks about bringing the series together and what the future holds for the title, including their hopes to have it debut on comixology.com very soon! To buy this book today, you can order it through their website. Be sure to listen in and discover another great indie comic! In this installment, I talk about some of the prose work I enjoy reading, from Dragonlance to John Grisham. It’s time once again for our monthly on-location show at Collected Comics in Plano, TX. This month the discussion theme is horror comics, a perfect topic for the Halloween season. On this show, Derek is joined once again by Shea Hennum as well as the shop’s assistant manager, Freddy Rick, the resident expert on all things horror. (Another store employee, Sabrina, even makes a brief vocal appearance on the podcast, sharing her uncanny love of vikings and cheese.) Among the many horror titles they discuss are The Walking Dead, Hellboy, Rachel Rising, EC’s New Trend line from the 1950s (including Tales From the Crypt, The Haunt of Fear and The Vault of Horror), Revival, Weird War Tales, Richard Corben’s Edgar Allan Poe adaptations, Swamp Thing, Hack/Slash, Locke and Key, almost anything by Steve Niles, and the pre-Code comics that Craig Yoe collects in his many volumes. So get your freaky fright on for this ghoulish installment of The Comics Alternative podcast! Hey folks, here’s an Extra Point to pass the time! This time, Ian talks AnimeNEXT, Supernatural, Breaking Bad, Mad Men, The Walking Dead comic (slight spoilers for Volume 14 and 15), Saga, Hawkeye and a few more things! Enjoy! You can e-mail the show at comictiming@gmail.com, and be sure to Like us on Facebook at http://www.facebook.com/ComicTiming. Thanks for listening and we’ll catch you next time! Hey, look! It’s a full episode of Comic Timing! This time, Brent and Ian are joined by Gabe Perez, who now wanders around the podcasting world aimlessly after Strangers With Comics stopped coming out. In this episode, you’ll hear a bunch of conversation about the recent tumultuous changes DC Comics has been dealing with, including entire creative teams leaving books before they are even out. Plus, listen to our take on where Comixology might go next; will Comixology’s troubles with downtime lead to a shift in how companies release their digital books? Since this episode was recorded, Marvel reissued their Free 700 Issues offer, but the debate remains valid, as nobody could buy ANY digital books for nearly four full days while their server issues were being resolved. 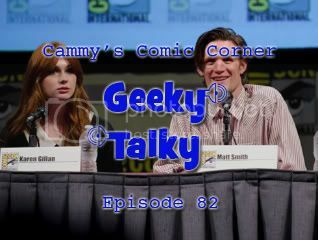 We also do a little general conversation as usual, including Superior Spider-Man and Avenging Spider-Man, Ian’s Brooklyn Public Library woes, the second to last episode of The Walking Dead Season 3, and a bit on The Walking Dead comics now that Ian is 70 or so issues in. Oh, and Gabe’s pipes are now clean. I left that part in because it’s GOLD!